Your brushes pt. 2: Flat or Round - which do you use most often? What shapes of brushes do you use and for what? Let's discuss! I was told to use the largest brush that I can use to keep the painting loose. However, I try to paint with whatever brush I can control the most with any details. I've begun using an angled 1/2" or 1" flat brush for a lot of washes. It is very versatile. I use a lot of rigger brushes for trees and foliage. I'm a watercolorist working from mostly pans, ergo smaller rounds fit into them better. I also use flats - the versatil flat wash 1/2" and 3/4", and a neptune 1" and 2" mottler which mostly moves water around. Only the smallest fits into a full pan. I love all kinds of round brushes. I find they are very convenient for both large surfaces and details as they can be pointy and sharp but also very soft. However, if I were to work on much larger pieces, I think large, flat brushes might be better to apply colour evenly. For my "medium" sized brushes (6mm approx diameter) I use round (this one I use most), and another smaller I use round. But I have a flat brush around 1cm in diameter and a larger flat one about 2ishcm. I like using this larger one for washes. I love flat angular brushes, so that I can vary line width more percisely. Moreover I like the energy of geometric strokes, and it is extremely difficult to achieve with a round brush. Round brushes are easier to ruin, harder to clean, so I vote for flat. Well i use both, Mostly flats as you can get a razor edge on them if you turn them sideways, they fill in areas well as making long sharp lines. For small detail work i do use both but rounds are more able to make certain details then a flat. Mops are great for expressive or area fills, im finding if im not doing a commission or paid piece i use them more. I do have a rigger i use and a pin stripper that get a little use if its a big watercolor. And i do use watercolors in my Aztec airbrush, it looks great and easy to layer. Plus the FX you can get are great. Never tried a oval or a fan in any yet, might one day when i have more time at the drafting table. For inking in Carbon Black india ink i use rounds for thier controlled but yet expressive lines, flats are ok to fill but i dont really use them for the inking process of comics. I use mostly round for watercolors. You can try to do some research on the body of the brush, Example, black body with a orange tip might make it a Raphael? Might work, but if its to old it might not be easy to find. I know when you get a good brush its hard to find them again unless you bought a ton then. For the better part of several decades I painted everything with a #3 Windsor Newton Series 7 brush. 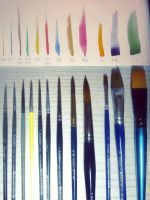 I have many more brushes now in different sizes and shapes but I've never been more actively creative than I was then. Ah, the Gold standard of the Series 7, i love the ones i have, best brushes, recently tho they have taken a down turn. Also for a cheaper model that might be floating around still at a shop is the Cirrus series by Winsor and Newton. Also Raphael brushes are still great. hold a lot of paint and keep a perfect point, don't you think? Yeah thier was/is a embargo on the Russian sable, and Winsor and Newton dropped thier quality right before that. I do hope it comes back to being good agian as i like my older ones, plus they do as you said hold the right amount of water and pigment. Just thier to expensive for me to justify the inking with them but doing watercolors im behind on them. When I first used watercolors I only used flat brushes. Now that I've picked it back up again, I use mostly round. I do have a couple flats that I still use frequently and I use a couple liners too. I would really like to get a hake brush and try that out as well. I do watercolors usually and all three see a lot of use - oval/filbert and round more so than flats, honestly. I use both flats and rounds. I guess I depend more on sables but I do love my one stroke. When it comes to other brushes; I almost always use the rigger for fine details, the little hard edged brush is great for lifting the highlights. The only type of brush I dislike is the fan brush: I found it suitable only for splattering. The marks just look too artificial for general use . Large flats camel hair for sky at very early stages of painting, for wetting paper, painting water. Round brushes Kolinsky sable and squirrel hair for general painting. Also fan brushes for grass - dry on dry - and distant trees or loose shapes - wet on wet. I also use liners synthetics for fine twigs or grass blades. Short flats for shapes like buildings or rocks. I have a special brush called Tree and Texture by Rosemary & Co. to help with trees and general texture. I mostly paint with round brushes since they're excellent for more detailed work and colouring linearts, but I love flat brushes for backgrounds. Both see equally much use in my home studio. same here, i use 0.1 brush for coloring lineart, and a bigger one for the base color, flat brush are useful for coloring background. For watercolours I use mostly rounds, but their softness/hardness varies- some are quite sturdy acrylic brushes! Round and soft, because I use watercolour paint. I switched to round brushes after a few years of using mostly flat ones, though for details I always used tiny round brushes. Never used oval/ cat tongue though, neither fan shaped. I use a Winsor and Newton Squirrel mop for area cover, as well as a Large Black magic flat mop. They are floppy holding alot of water and good amount of pigment/paint. They they dont hold thier shape if worked to much and well need tobe rinsed and reshaped..
Nice photo of your brushes.